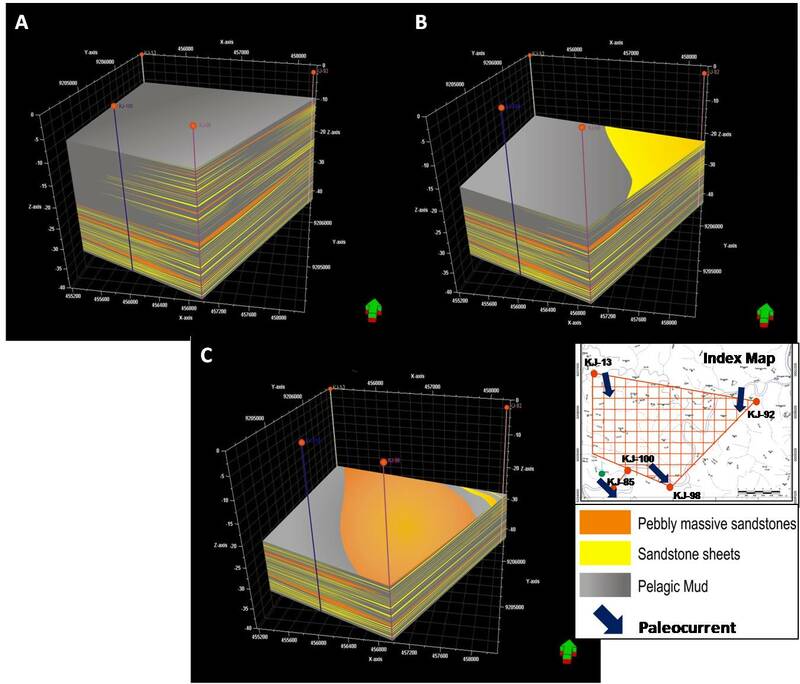 Fluid extraction from 3D seismic data (Mohammedyasin et al. 2016). Stratigraphic modeling provide more realistic geomodels based on stratigraphy and sedimentary processes. Stratigraphic modeling can represent both the dynamics of sedimentary systems and simulate the filling of sedimentary basins. Stratigraphic modeling of the Mexican margin of the Gulf of Mexico during the Mio-Pliocene (From Granjeon, D. 2010). Geological analog plays critical roles towards contributing to comprehensive information in many application areas. the lack of resolution on subsurface datasets (i.e., seismic and well) can be problematic in predicting production performance during development and optimization stages. This paper demonstrates the combination of terrestrial photo-scanning and photogrammetry techniques to aid understanding of thin bed architecture and the implication on reservoir behavior in deltaic system. The outcrop area covers approximately 0.2 km2, comprised of three lithofacies deposited in tidal-flat and mouth-bar environments. The outcrop exposure was of geological interest as an analogue to the existing reservoir in the Mahakam Delta. Detailed sedimentary sections were measured in order to investigate temporal and spatial changes within a stratigraphic framework. 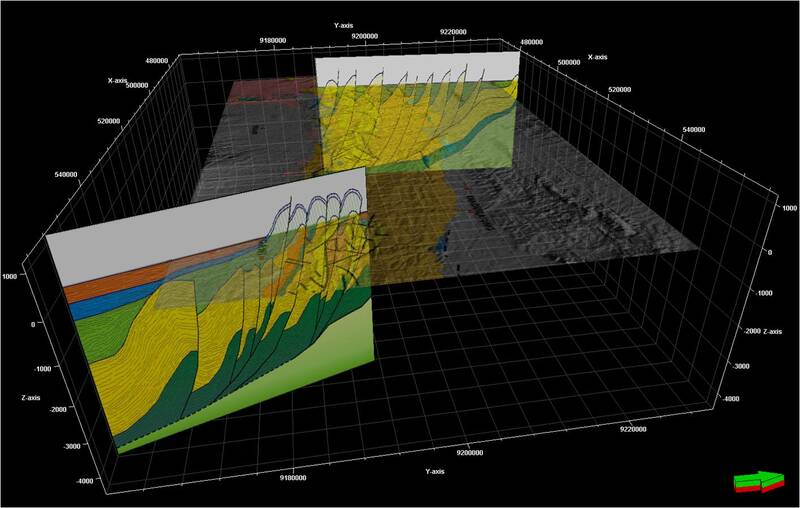 Photomontage correlation and architectural element analysis were performed, and a 3D Digital Outcrop Model (DOM) was generated, constrained by field observation to reduce geological uncertainty. In addition, samples were also collected to measure rock properties. Different grain size values were assigned to each lithofacies and populate variability within the minimodel. Photorealistic and outcrop intensity attributes formed the basis for key sedimentary surfaces and build up a full 3D geo-cellular volume. The results indicate that distribution of lithofacies and facies association holds primary control of variation on reservoir properties. In addition, the ability to capture geometry of small-scale features with DOMs as representative subsurface analog has been useful in improving understanding in reservoir modeling, identifying the remaining potential as well as being applied in future development strategies (i.e., injection, infill, horizontal) to enhance oil recovery, particularly in mature hydrocarbon fields. Regionally, Kendeng was a W-E deep depocenter that extensively located along onshore part of East Java Basin to the southern offshore of Madura.The depocenter is a complex area with slightly number of hydrocarbon discoveries. This paper discussed petroleum system components in Kendeng onshore area. Integrated regional and recent update surface observations transect Kedungjati –Djuwangi-Ngawi areas conducted to help identified petroleum system components toward future exploration in this area. Pelang shales from Djuwangi has poor to good of organic richness (0.11-1.54 wt. % TOC), dominantly immature and demonstrates low ability to produce hydrocarbon (S1+S2 = 0.15-4.21 mgHC/gram rock) from mixed kerogen type II & III. Lack of information in Eocene because there are no drilled wells penetrated to the section, thus there is still questionable that the origin of oil & gas surrounding Kendeng is related to Eocene source rock. Possible reservoir rock within Kendeng is Miocene Kerek sandstone. Primary porosity of the sandstone is ranging from 2-8% with 1.2-6 m of maximum thickness. Calcite cement and long period of burial history impacted to the poor quality of its properties. There was any misconception from previous researcher that correlated the sand with Lutut, Jaten and Ngrayong quartz rich sand. Oil seeps found in Kedungjati, Djuwangi and Kedungwaru indicated that there was something leakage due to trapping failure, the hydrocarbon migrated to northward through faults and charge present day existing fields in Randublatung area. A) TOC and REP of Pelang shales. Crossplot Tmax vs HI (left) reveal the source rock quality and maturity of Pelang Formation was dominantly mixed kerogen type II & III and immature. 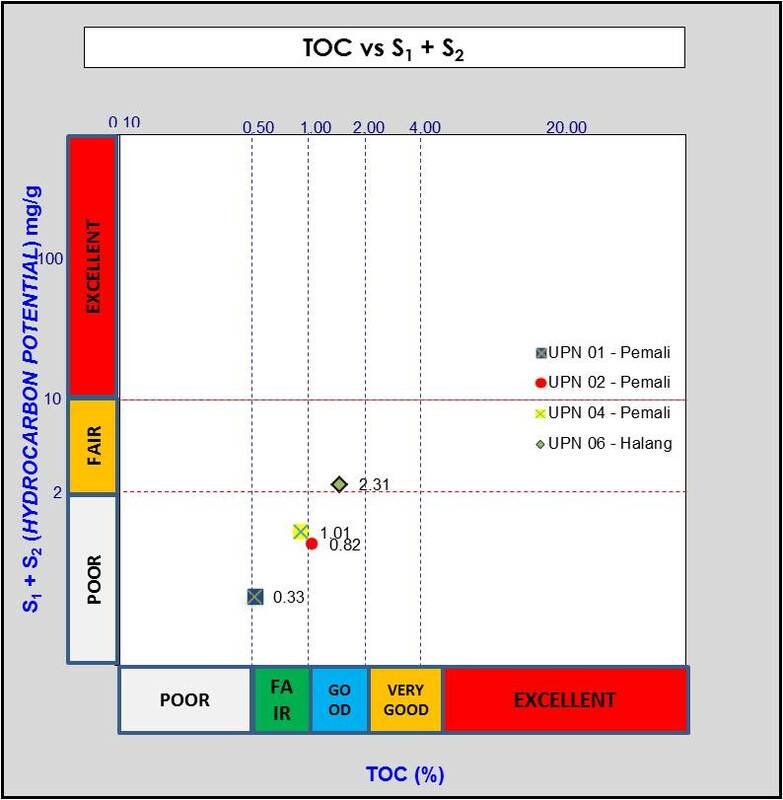 Crossplot TOC against PY (right) indicated the quantity of organic richness is poor to good poor to with fair hydrocarbon source potential. B) Gas chromatograph fingerprints of Pelang shales indicated marine environment (right) with minor influence from terrestrial (left). The proven petroleum system in Kendeng is only well developed in Southern Madura Sub-Basin with marginal oil & gas reserves. Future exploration and/or step-out strategies in Kendeng could be focused towards the edge of Ngawi and South Madura Sub-Basin (Eastern Kendeng) with Kujung reef and globigerina sand as the main target. Detail prospects investigation in northward of Bogomiring Field and westward of Petiken-1need to be matured by add subsurface analyses. Bouger gravity anomaly of Kendeng which divided into four segmented sub-basin which separated to each other by intra basinal ridge.The blue box show indicated area of detail surface observation. Turbidity currents are gravity-driven turbid suspensions of fluid and sediment entering the water. They form a sediment gravity flow in which the suspended sediment is supported by fluid turbulence during the transportation. The velocity of turbidity currents usually decrease due to the flattening of slope, overbank flux from currents along submarine channel, or the spreading of streams over seabeds at the bottom of slope. 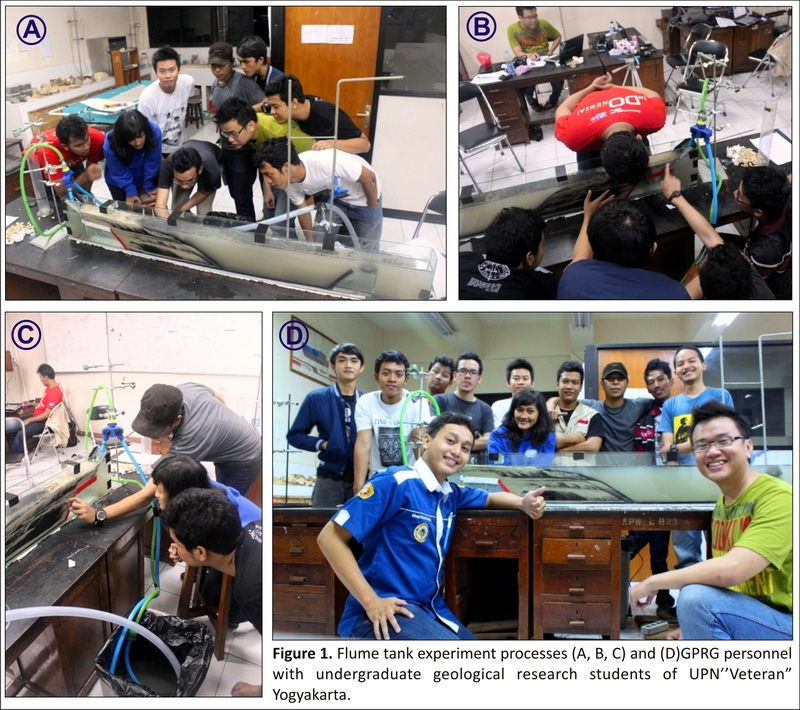 An experiment was performed in order to demonstrate how a simple turbidity currents modeling can help understanding the interaction of turbidity currents flows entering the water with difference density layer. 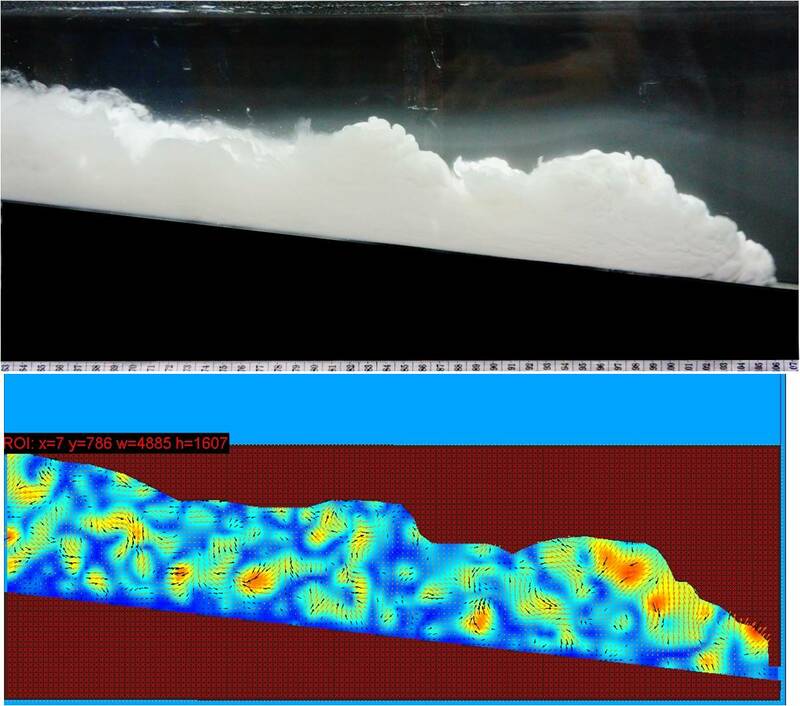 The method used difference density grains, mud, and water with different certain composition and pour it into a flume box model. Experiment results revealed that the velocity of turbidity currents are faster in the beginning than at the end of deposition, while the bulk density of the turbidity current was less denser than water layer, the current spread at the pycnocline (Boundary between fresh and saline water). The head of the current advanced rapidly when it lost contact with the bed. Grains settling out of the current fell through the dense water layer forming an extensive deposit. Meanwhile if the bulk density of the turbidity current was denser than the water layer, the current continued as an underflow moving into the deeper water. In addition, the movement of turbidity currents is formed because there is density difference between fluid and sediment material. At the end, understanding the quantitative aspect of turbidity currents is essential towards betterment analysis of turbidity currents itself. Petroleum exploration in fluvial plays has brought numerous attentions in the past recent years in Indonesia. Various stratigraphic plays of the Mesozoic and Cenozoic fluvial successions have adequately demonstrated ability being prominent habitat of hydrocarbon. The lack of understanding concerning morphology along with the complexities is thought to be one of the major problems that contribute the most to the failure of drilling results. This study attempts to introduce a new experimental method in order to examine fluvial morphology response associated with base-level changes. In addition, this method produces stratigraphic features that serve as an analog to better understand well-to-well correlation and help to assist geomorphology interpretation. Materials used are mainly composed of mixed fine-grained sands and coal powder, loaded and run on the Stream Table Experimental Landscape (STEX). The apparatus represents prototype of sedimentary deposition in the fluvial system, being integrated with geological input of erosion, sediment supply, and base-level changes. During transgressive event, base-level shifts to the landward, hence restrain the fluvial erosion and produces high sinuosity (meandering). Moreover, active deposition of transgressive sediments in the downstream area creates a high width-depth ratio of channel morphology. Highstand event contributes to development of medium sinuosity, and moderate channel morphology in both upstream and downstream areas. Lastly, the subsequent base-level fall (lowstand) will create a straight to slightly sinous, deep, and narrow channel morphology. This succession is interpreted to produce best reservoir potential, composed of bedload sediments with laterally extensive distribution. In the case of shallow fluvial system, Transgressive Surface (TS) deposit would provide good seal integrity of sediments, dominated by shale and very fine-grained successions. 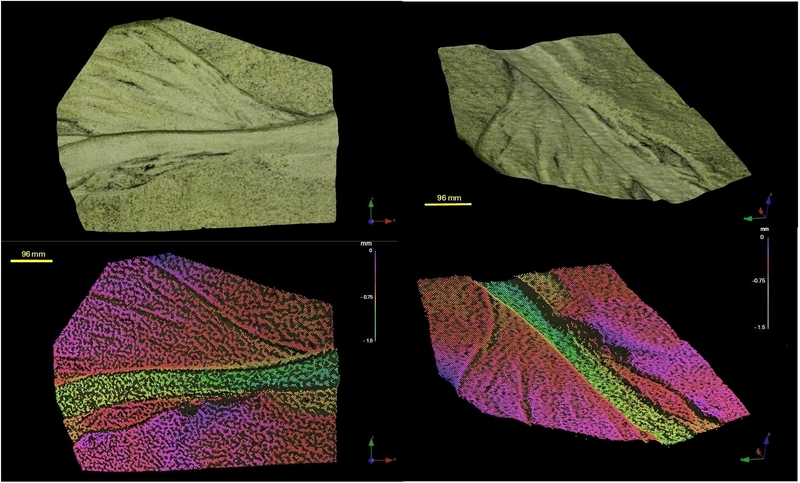 DMS scanning extracted the digital elevation model (DEM) of early lowstand fluvial morphology modeling. Together, STEX offers a fast and efficient method to leverage our understanding with regards to such complex fluvial system. 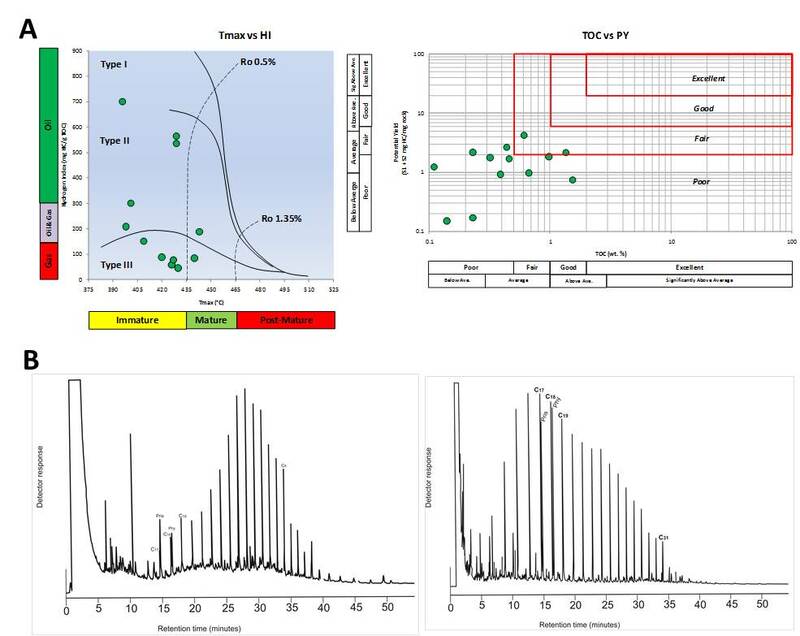 The application of this tool conveys fundamental, yet critical information that significantly could improve existing fluvial-related play concept as well as providing new insights towards future hydrocarbon exploration. Rift stratigraphic framework is commonly linked towards rapid mechanical subsidence regime, where episodic succession is primarily controlled by tectonic subsidence within a short period of rapid accommodation, in response to extension and fault reactivation. Bengkalis Trough is part of rift basin in the Malacca Strait, composed of Paleogen syn-rift strata, yet generated a very promising hydrocarbon system. These including Pematang Formation, which consists of thick conglomeratic sandstone layers overlied by deposition of organic-rich brown shale. 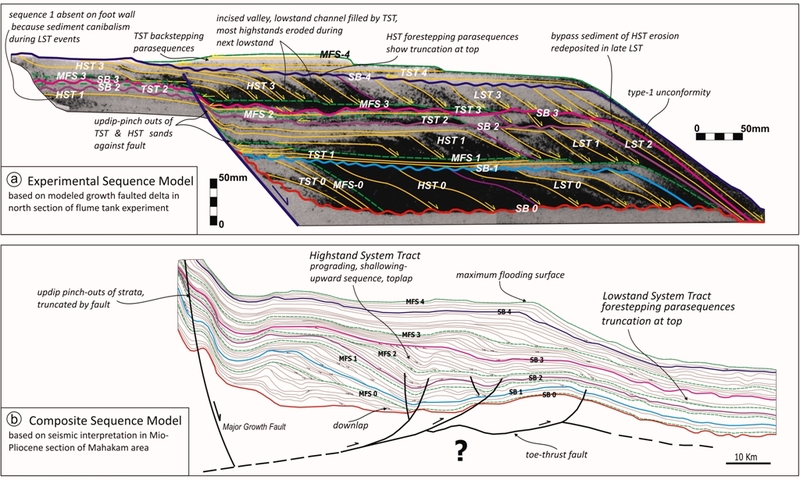 This study aims to better understand complexity of sequence stratigraphy and depositional of fluvial system within a rift-basin. 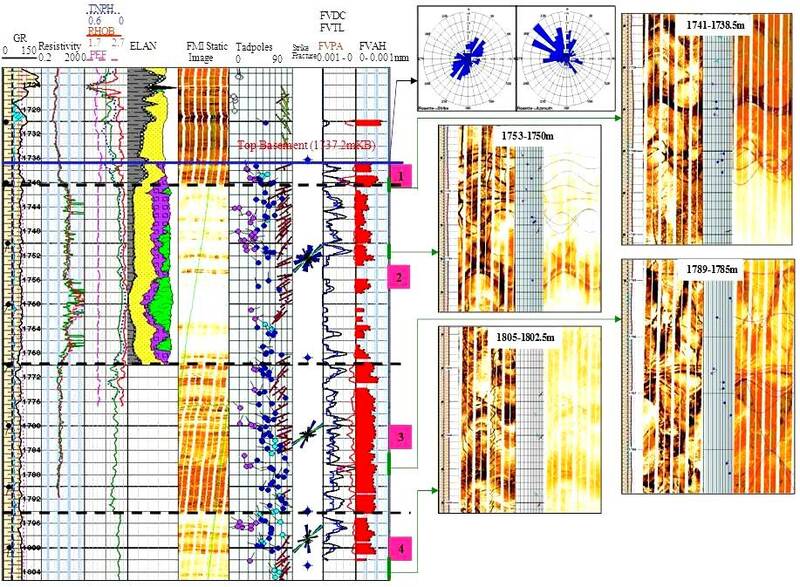 Numerous records were incorporated, such as core, FMI and wireline logs, and biostratigraphy data, in order to result comprehensive interpretation and model. In addition, both analytical description and stratigraphic approach may contribute an insight about the syn-rift sequence stratigraphy and sedimentary process during deposition of the Pematang Formation. 2D strike line correlation showing vertical fluvial architectural element of Pematang Formation. Our interpretation indicates that Pematang Formation was deposited by series of processes in fluvial depositional system. Major sedimentary features are identified: (1) massive conglomerate (Gm) facies; (2) plannar cross-bedded sandstone (Sp) facies; (3) laminated sandstone (Sh) facies; and (4) massive claystone (Fm) facies. Three depositional sequences were observed based on stratigraphic evidence, with each sequence is bounded by flooding surfaces (SB1, SB2, SB3, and SB4). In general, major sequences are consisted of Lowstand System Tract (LST), developing a stacked-channel deposited in braided system, whereas Highstand Systems Tract (HST) are composed of individual channel deposited in meandering system. Together these evaluations are able to reveal sedimentation processes and history utilizing integrated resources as well as application of sequence stratigraphy development in the rift-related sedimentary basin. South Central Java Basin, particularly it’s western most portion Banyumas Sub-basin is relatively lesser known than it’s adjacent counterpart such as East & West Java Basin. This forearc basin, formed by subsidence of south part of Serayu Range as the isostatical compensation of uplifted area triggered by two opposite regional strike slip fault. The resulted 7,954 km square basin is filled by thick succession of volcaniclastic deposit, and it is still remain an enigma whether this thick deposit have succeed in maturization of source on Neogene stratigraphic unit or not. A) Outcrop photograph of Neogene stratigraphic-Pemali Formation, B) Close up photograph of carbonaceous shale of Pemali Formation. Indentification of maseral which indicate the hydrocarbon content using UV. Overall, the result of this study concluded that Neogen Stratigraphic unit are possibly defined as source rock potential, and further evaluation has to be directed toward older lithology, probably from Paleogen stratigraphic unit, to find potential effective source rock of Banyumas Sub-basin. East Java lies on the South East (SE) margin of Sundaland and filled by thick sequence of Tertiary volcanic sediment. The product of Oligo-Miocene volcanic, even quartz deposits were widespread and an important accumulation of hydrocarbon. SE Java is one location contributed quartz-rich sand around volcanic arc. 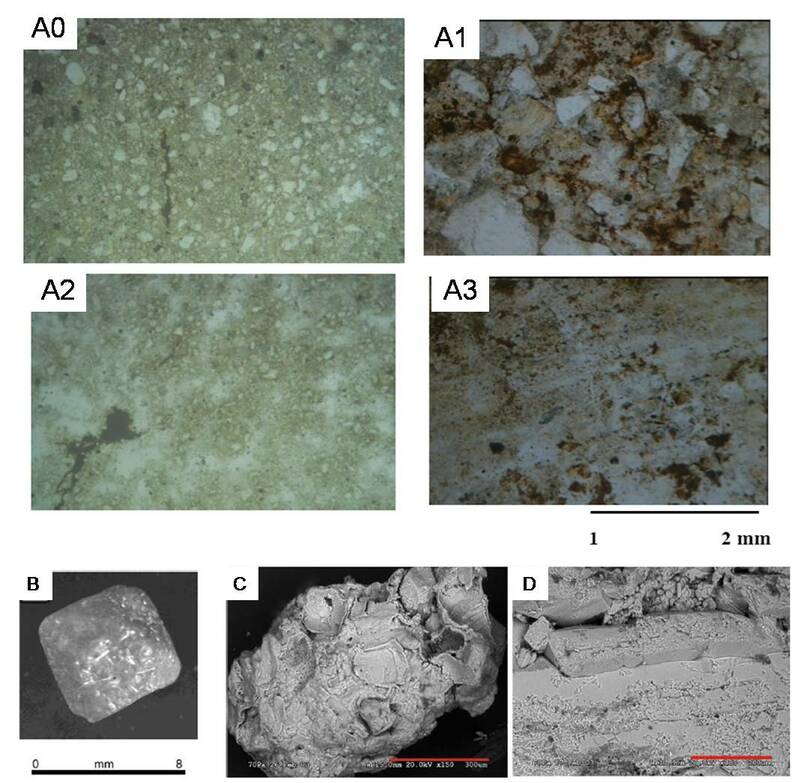 This study is concerned with the primary result of quartz sandstone observation within Jaten Formation that has been an issue as potential reservoir among Miocene volcanogenic influenced. Figure 1. A) Outcrop of Jaten Sandstone in Sidorejo village , (B) close up of quartz sandstone with parallel lamination structure, and (C) close up of quartz sandstone with flaser structure. Figure 1. the several thin sections of Jaten quartz-rich sandstones,( A0&A1) composed of bypiramidal quartz grains and rounded embayment. (A2 & A3) quartz wacke in sandy facies, (B) bypiramidal crystal. Previous study (Smyth,2003) C) SEM image of rounded embayments and me lt reaction textures. F) SEM image of microcrystalline growth on the surface of the grain. White bar = 1mm in photomicrographs. 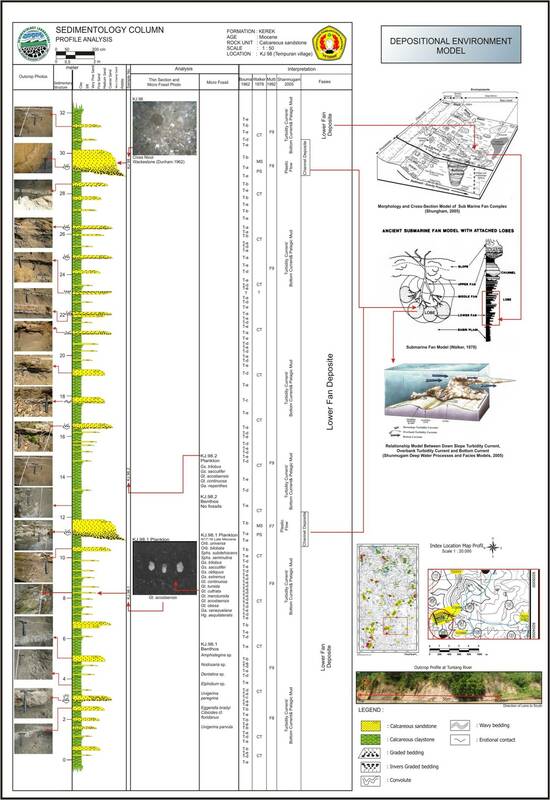 Integrated biostratigraphic, petrographic and lithofacies analysis revealed the sandstone of Jaten Formation deposited in terrestrial to transition environment with fluvial point bar and sand flat facies associations. They are interpreted as a part of lower flank of the volcanoes in the south connected to open marine in the northern part, indicate fluvial to estuary depositional system among active volcanoes setting. The existence of thick volcanic materials in SE Java have previously been negligible. In fact, it has valuable implication for basin history, provenance, and reservoir properties to resolve exploration problems in SE Java. 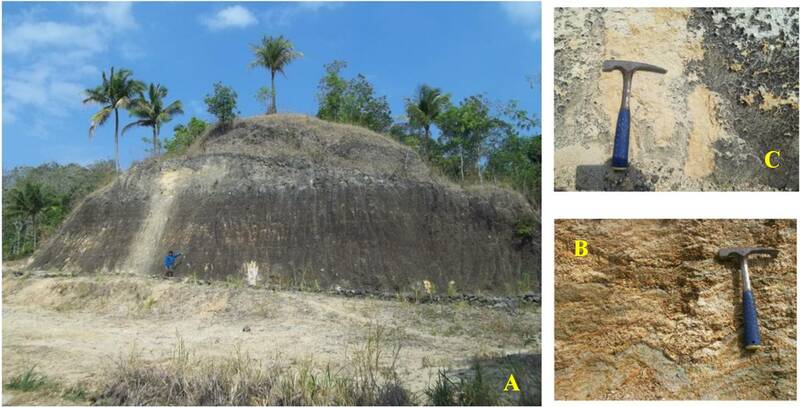 Experimental study was attempted to demonstrate how the evolution of an orogen could be control sedimentation and erosion on the spatial and temporal distribution of fault activities within Kendeng area (figure 1). Moreover, current model provide a new perspective to evaluate risk associated with trap formation in thrust tectonic setting. The experiments were constructed in 3 scenarios of physical models: a) none; b) low and c) high of sedimentation & erosion. Varied basalt detachment tilt angle (0˚, 4˚and 6˚) designed as main structural parameters in ± 3 hours of each experiment. Figure 1. 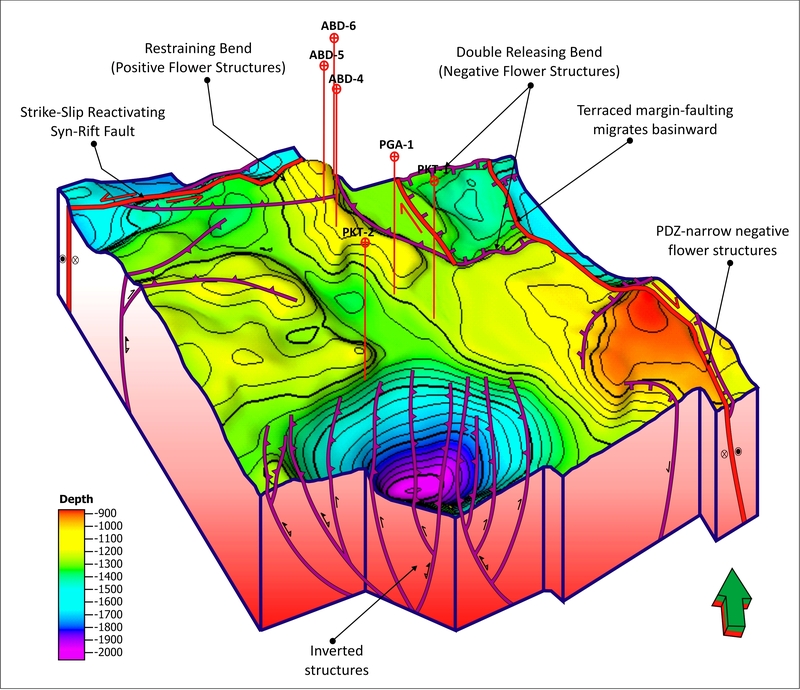 3D structural modeling showing the structural style of eastern Kendeng Fold-Thrust Belt. Principally, experimental results revealed that geometric and kinematic of Kendeng fold and thrust belt influenced by effect of Plio-Pleistocene syn-contractional sedimentation and erosion. The values provide the interpretation that area with higher syn-contractional sediments of thrust reactivation may have lower risk for hydrocarbon trap location due to positive effect of sedimentation building, thus we concluded that Eastern Kendeng fold belt is more effective for trap location than its Western part. Figure 2. 2D physical sandbox modeling is an important method for understanding kinematic and geometric of fold-thrust belt. 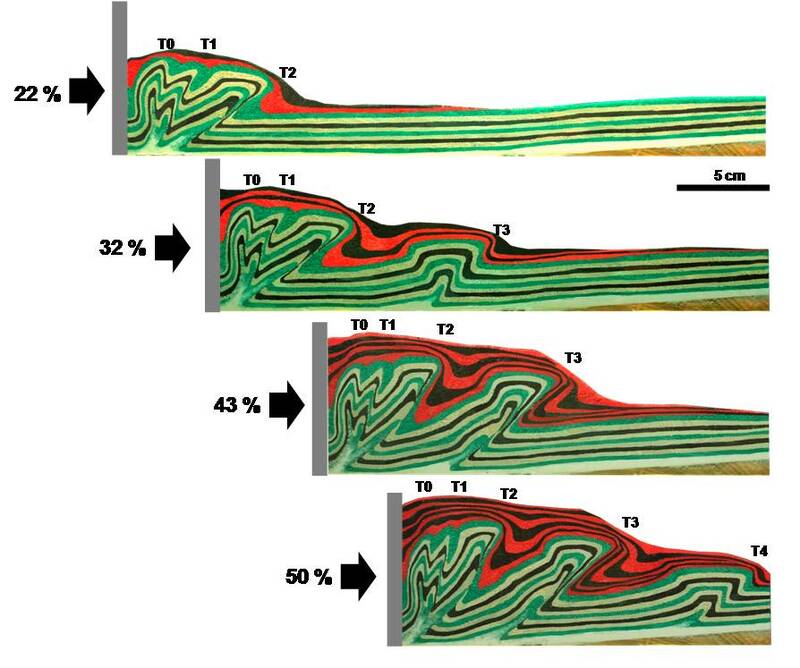 T1, T2, T3 and T4 arrow on the figure 2 are thrust reactivation & development ( example for no sedimentation- erosion sandpack and sedimentation sandpack ). Understanding of Kendeng fold and thrust belt kinematic using experimental study is important to define timing of trap formation relative to generation and expulsion of hydrocarbon. It is also critical and significantly improves hydrocarbon play concept as well as opening new perspective toward future exploration within Kendeng fold thrust belt. The experiment is a part of Stratigraphic Analogues for Reservoirs Project of GPRG . This project provides natural, physical and quantitative model analogues for reservoir scale stratigraphy, particularly for growth faulted delta and fluvial deltaic setting. Physical stratigraphy experiment of particular sedimentary system is commonly modeled to obtain a better understanding of the stratigraphic architecture, succession and its stratal pattern. Analogue studies are predominantly qualitative in nature and based on the similarity of process principle (Hooke, 1968; Posamentier et al., 1992; Wood et al., 1993; Koss et al., 1994; Milana, 1998). 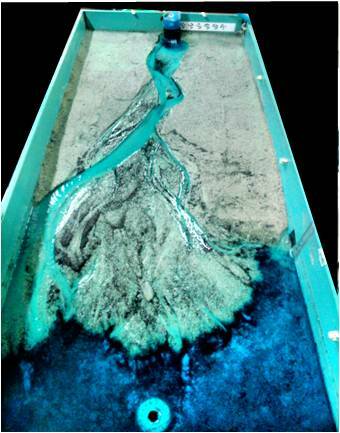 In this article, we would like to demonstrate how a sedimentary system can be scaled down to the size of a flume tank, and how the quantitative analogue flume modeling results can aid in understanding depositional architecture of growth faulted deltas setting. The experiment was calibrated with 2D seismic stratigraphy interpretation across the Mahakam area. Furthermore, our approach is directed toward application and testing of sequence stratigraphic principles and the ability to define the significance elements of petroleum plays in each system-tract. Figure 2. 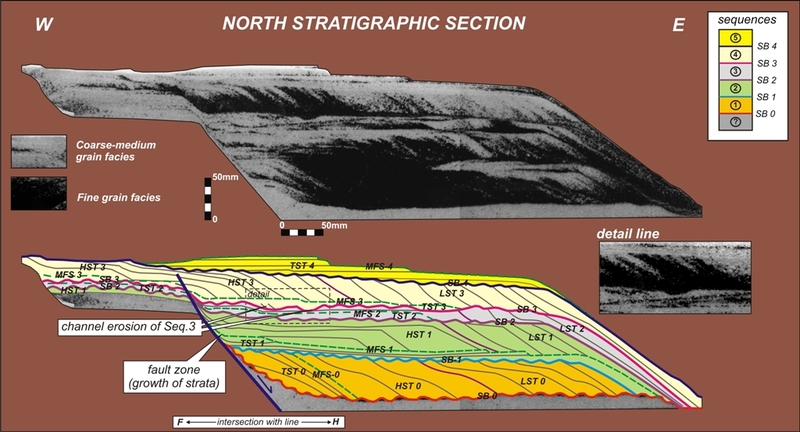 Sequence stratigraphic interpretation in the north section of experimental model (dip oriented slices). Dashed green lines indicate the Maximum Flooding Surface (MFS) and sequence boundaries are marked as solid line. The insert shows lowstand channel on the hanging wall, which eroded the previous sequence 3. Figure 3. Comparison of (a) Sequence model based on experimental result and (b) Conceptual model for Mio-Pliocene sequence of Mahakam area. Almost the clinoform pattern of them display similar geometries. During the Eocene to the Miocene, Kendeng zone was the main depocenter in the North East Java basin. It is a back arc basin related to Oligo-Miocene volcanic arc, resulting from the uplifting of Southern Mountain Zone of Java and filled with thick pelagic and volcaniclastic sediments. This paper emphasizes determination of the facies, distribution and geometry of Miocene Kerek sand bodies. 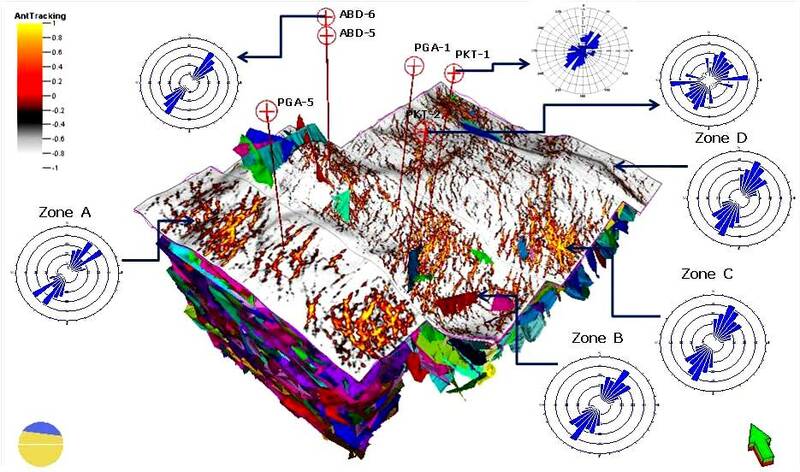 The main data is based on outcrop data considered as having high reliability to support subsurface studies, related to turbidite sands reservoir geometry and distribution. Figure 1. The Fieldwork was conducted in Kedung Jati Area, Boyolali Central Java. 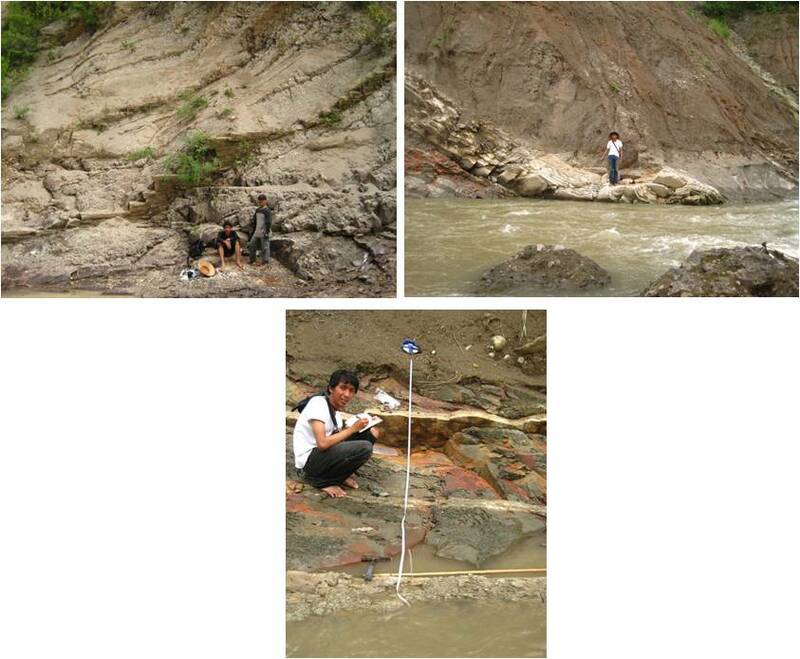 Field activities comprise field geological map, outcrop measuring section, rock sampling, and paleocurrent measurement. This study uses 8 measuring sections generated along river traverses in study areas and 10 outcrop rock samples. The samples have then been analyzed to describe and are characterized using petrography, paleontology, and sedimentology analyses. Based on facies analyses, there are three depositional facies of Kerek sand, consisting of a shallow channel of submarine lower fan, a lobe of submarine lower fan, and pelagic mud deposits. Statistical analysis is also being used to characterized Kerek sand, and describe it more in geometry into: (1) Shallow Channel deposit (mean distribution of sands bodies: 4.58 km, mean thickness: 0.6 m, length from 3D fence diagram: 1.58 km), (2) Lower Fan Lobe Sheet (mean distribution of sands bodies: 2.85 km, mean thickness: 0.08 m, length from 3D fence diagram: 1.26 km), (3) Pelagic Mud, this deposit solely consistings of thick mudstone lithofacies. In term of reservoir potential, the channel deposits have a significant amount of porosity. Parangtritis South Central Java is southern edge of Yogyakarta Basin filled by Quaternary sediment from Merapi Volcano, Wonosari Plateau, and Progo hills. The existence of dune that adjacent beach become the interesting object of natural phenomena in South Coast Java. As one of coastal dune in indonesia, it has various characteristic stared from sedimentology aspects and depositional history in tropical climate. In further understanding the characters, the study was conducted by several methods namely landsat observation, ripple index measurement, grab sampling, flow velocity and direction measurement, spot coring,and outcrop profiling. Sedimentology characteristic of bedform types are divided into planebed lamination, plannar crossbedding, sandflow strata (chaotic structure, slumped degradation) and dunes with ripple index measurement 3,5 with mean height : length : 1 : 4 m. Granulometry analysis reveal that dune area is not developing with skewness relatively coarse grain and poorly sorted, in opposite it pricesly formed in area which has skewness relatively fine and well sorted. the result of wind direction measurement shows overall dunes oriented from SE to NW trendline. 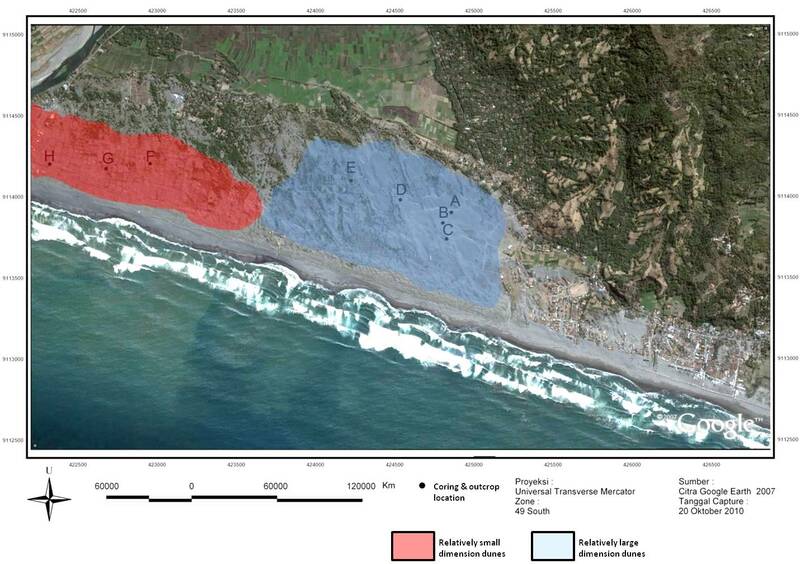 there can be summarized that coastal dunes development are mainly controlled by intensity and transportion process of particles beside wind factor, vegetation, and existing barrier. Figure 4. 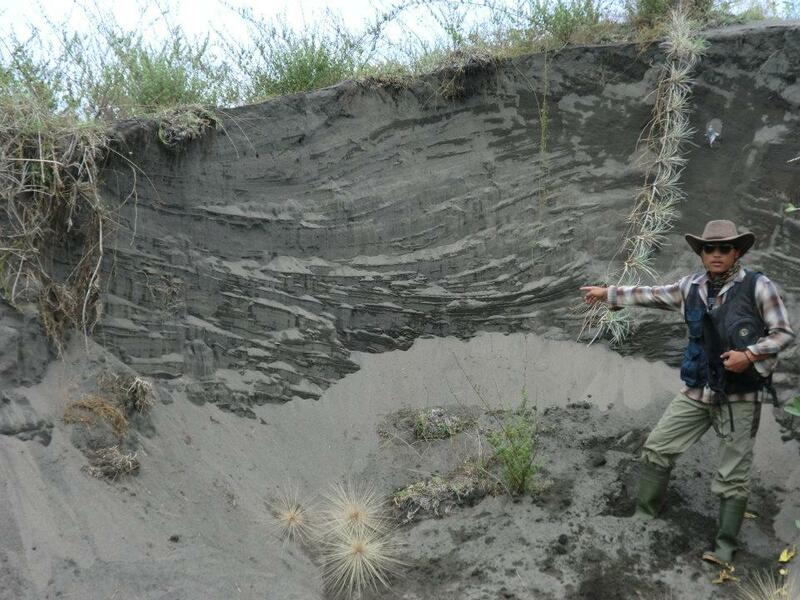 Zaenal Fanani is showing a megacross-stratification of an inactive dunes at Samas Area,Western part of Parangtritis. the barchan dune did not significantly develop in this area and Grain size is getting coarser than Parangtritis. Figure 5. Sand samples from several southern beach of Central Java under binoculer microscope. Sample (a): Baron sand , sample (b): Parangtritis sand, sample (c): Samas sand. In this project, several sand samples had been collected from Samas beach in west part and Baron beach in east part . that was conducted in order to compared a provenance of Parangtritis beach. Based on observation under binoculer shows that sand in Parangtritis beach is dominated by quartz, heavy mineral like hematite, magnetite and plagioclase with lacking lithic, hornblende, and pyroxen. The sample which has been taken in Samas beach explain a significant difference in amount of lithic which greater than parangtritis beach. The presence of hornblende, orthoclase which have a very well shape and dominant are also quite in contrast. Nevertheless both of samples are interpreted from the same source namely merapi volcano. Meanwhile sample from Baron beach shows shell clast, calcite, and aragonite dominated. The grain shape tend to form a rounded than 2 other samples subangular. It is interperted as limestone reworked around Baron beach. 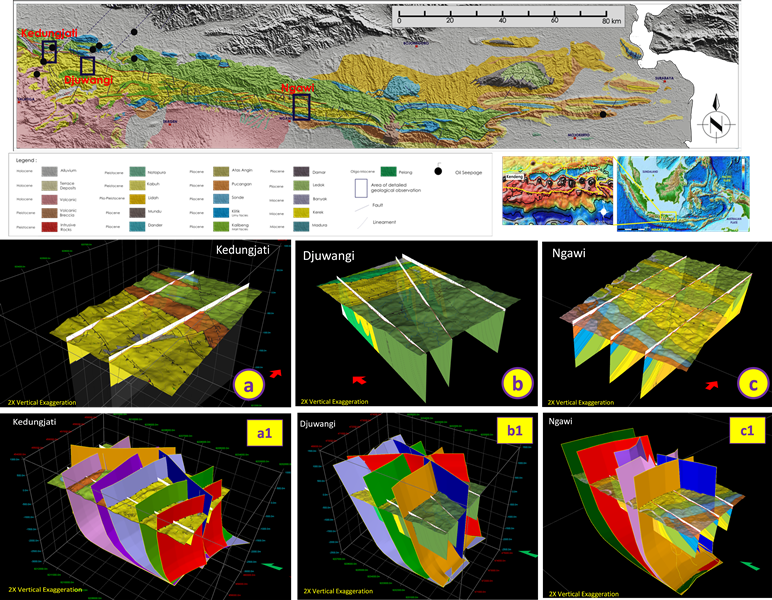 The development of basement structures in Pangea Block (PB) had a complex geological history related to poly-phase deformation of Sumatra.The application of conventional seismic method for naturally fractures distribution mapping could not be conducted directly due to dimension of fracture that below the seismic resolution (sub-seismic). 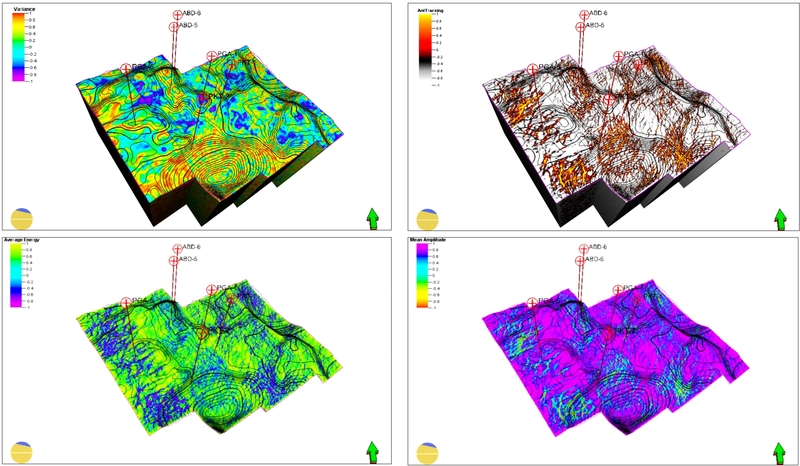 This article presents integrated geology and geophysics methodology for fractures mapping in basement using integration of structural model and seismic attributes analysis. The result of they were expected to provide input for further oil and gas field development, particularly on basement interval. Kinematically, the structural framework of the block was reconstructed by palinspatic reconstruction that represent structural style of PB (Figure 2). Three main styles of deformation are observed such as : transtensional rifting and oblique compression followed by wrench and reverse (inversion) faults. The structures interpreted as the development of old structural grains that had been existed since Pre-Tertiary. Transtensional regime during Late Eocene produced half graben system in the southern of PB, meanwhile in the eastern area it also reactivated the old grains became wrench fault system as pull-apart basin. The transtensional (releasing bend) of the structures associated with negative flower structures, subsequent the deposition of Lemat/Lahat Fm. and Talang Akar Fm. sediments until Early Miocene. 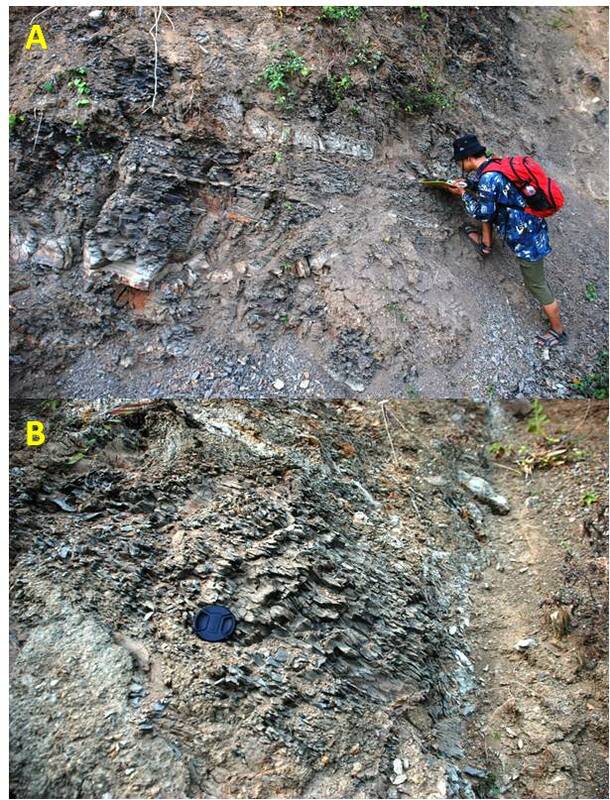 During deposition of carbonate sequence of Baturaja Fm., the tectonic was relatively quiescent. Figure 1. The 3D conceptual structural model on top basement surface of Pangea Block. 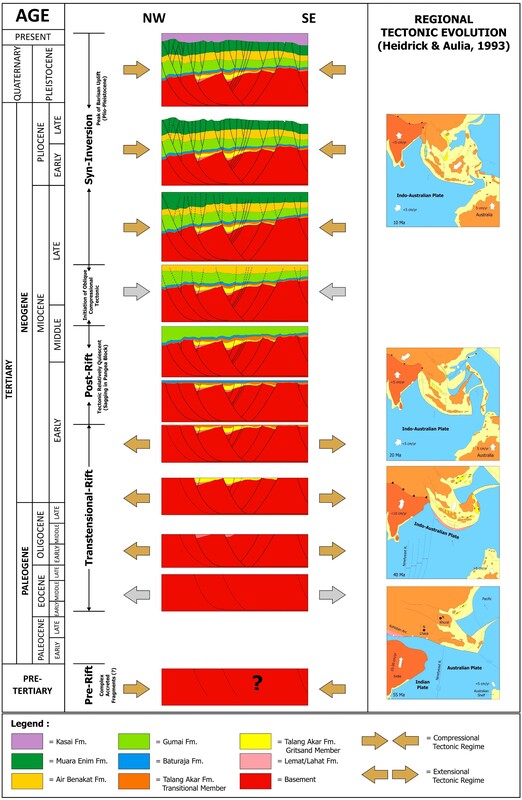 The convergence zone of oblique subduction between Indian and Eurasian plate that has actived since Neogene generated combination of compressional and translation forces which encountered of Sumatra (Ryacudu, 2005). In PB, it began to occured after deposition of Gumai Fm. had been completed and culminated during Plio-Pleistocene. The deformation caused reactivation of several syn-rift fault in PB became inversion structures both in southern and western area, respectively. Figure 2. NW-SE palinspatic reconstruction of Pangea Block. This model used to predict the time of fractures generation related to regional tectonic event history. Generally, most of the existing structures on the block are involving basement geometry, but in some places the structures also observed intersect just in the Tertiary rocks interval. They are indicated the Plio-Pleistocene tectonic is not only controlled the development of old structural grains but also produces the new structural pattern. The deterministic fractures model of the block was constructed by integration of FMI data and ant-track cube attributes. Firstly, the ant-track attribute must be generated from variance cube, then the conductive fractures analysis from FMI used as constraints input in second generation of ant-track attributes (Figure 3). It was performed to filter open fractures orientation with another fractures, then the extracted of the filtered attributes will connected the discontinuities become the three dimensional geometries of the open fractures planes. The details of filtered ant-track attributes extracted shows the major orientation of the fractures are : N 034.96 °E and N 054.36°E of Zone A, N 034.10°E of Zone B, N 023.26°E of Zone C, and N 024.35°E of Zone D with average dip ranging 50˚-80˚ (Figure 4). The orientation has clearly indicated the similar trend related to transtensional event in PB during Late Eocene. In this case, palinspatic reconstruction guiding the interpretation that the fractures produced by extension tectonic are pure extensional and open characterize, whereas the compression tectonic during syn-inversion sequence (Late Miocene to the present day) produced closed, stylolithic and/or partially open fractures. The origin and time of fractures generation must be define at the first, because they are extremely important as a media of hydrocarbon storage in basement rocks. The applied of integrated concept as further can used to predict the possibility of hydrocarbon charge in fractured basement rocks. Figure 3. Conductive fracture characterization of FMI PKT-1 well. The result of analysis is used as input to filter the open fractures in ant-track cubes. Figure 4. Deterministic fractures model of PB showing the major orientation of open (extensional) fractures with NNE-SSW and NE-SW trend dominant in several observed zone of PB. 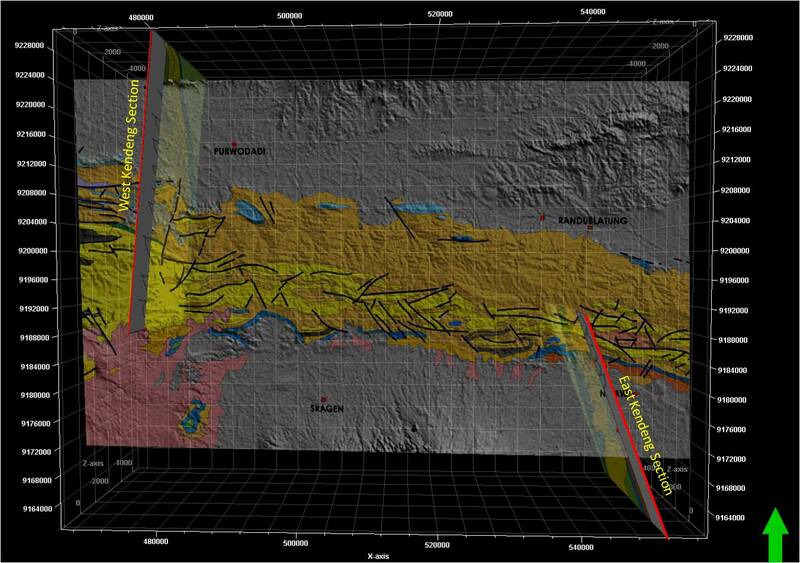 Comparison of structural intensity map which derived from horizons slice of variance attribute and filtered ant-track attribute revealed the fractures distribution are generally developed around of the fault system (Figure 5). The loss of energy and decreases amplitude values at locales coincident with the occurrence of low similarity (high variance) zones which cleared by ant-track attributes. It suggests that the presence of structural features will causing disruption to the seismic signal are linear, absorb, and scatter seismic energy in such a way as to lower the average signal and amplitude (Figure 5). The horizons slices of ant-track and amplitude attribute with analysis window ranging 10 – 30 ms used in this study. It has been considered to avoid window selection widely, if the the window is too wide, it will disturbed attribute response by the noise, thus the result do not show the actual of structural features. Figure 5. Comparison between horizons slices of variance, ant-track, and amplitude attribute to identify intensive fractures area. In basement high, the distribution of open (extensional) fracture are intensively develop around of the NW and SE area. Significant of DHI signature was observed in the internal part of BRF limestone, appropriate on the top of the NW basement high of PB. The signature revealed the potential amplitude anomalies as a reversal of the cosine phase and as flat spots (Figure 6). 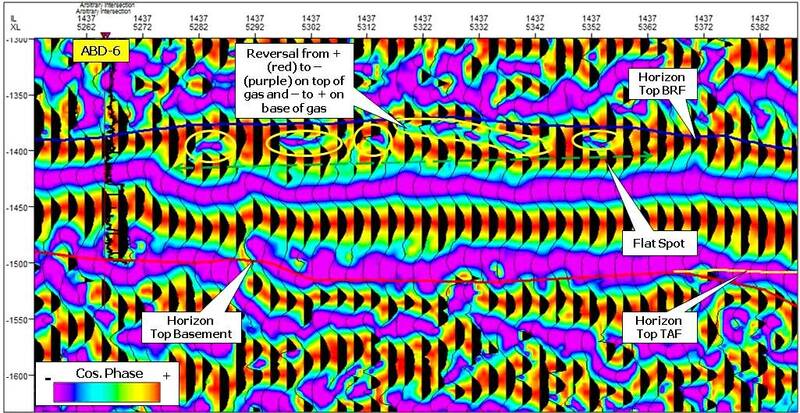 Recent drilling results confirm the existence of gas in the BRF interval of ABD-6 wells. It is indicated that the basement rocks below the interval may have a gas contain in the open fracture network. Although no one DHI signature was observed around of the SE basement high, this area still has any possibility become fractured basement reservoir. Because the area has the high intensity of the open fractures. Figure 6. A closeup of cosine of phase showing the DHI anomaly as flat spot and reversals of the sign of the cosine phase in the top of northwest basement high around of ABD-6 well. Red is positive and purple is negative. FMI analysis results shows the average fracture porosity and density of basement rocks of PB are <0.05% – 0.10% and 1,79 – 1,88 fractures/m, respectively. The main factor which control the properties are type of basement lithology, fracture spacing and aperture. However, since these properties are based on data from just three wells, this conclusion is pre-eliminary and must be applied cautiously. Geochemical information obtained from previous study at Gunung Kemala-67 and Talang Jimar-204 wells shows the waxy sapropelic deposit of Talang Akar Fm. are fair sources of hydrocarbon and in an early mature stages (Sardjito et al, 1991). 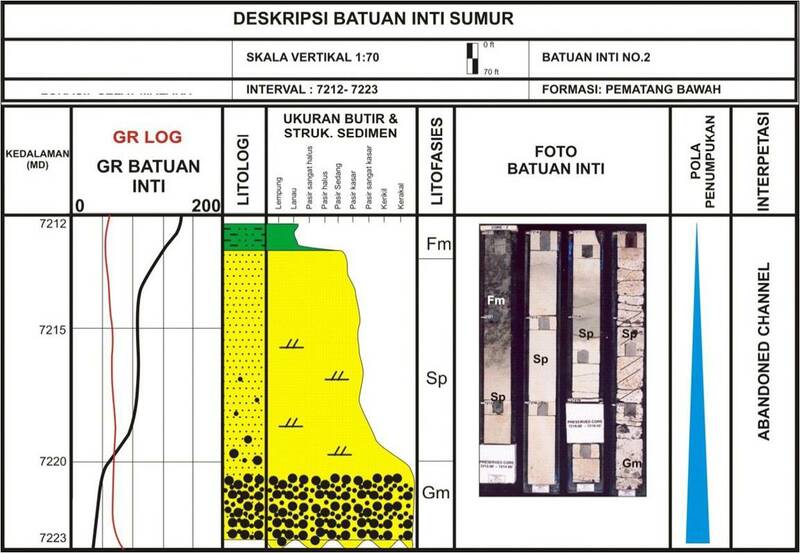 Tanjung Miring deep at the north of PB possibly as a hydrocarbon source area (Figure 7). The hydrocarbon migration interpreted has been proceeding since Middle Miocene to Recent throughout onlap lines of Talang Akar Fm. from Tanjung Miring deep then charge laterally and trapped into the fractured basement high of PB. 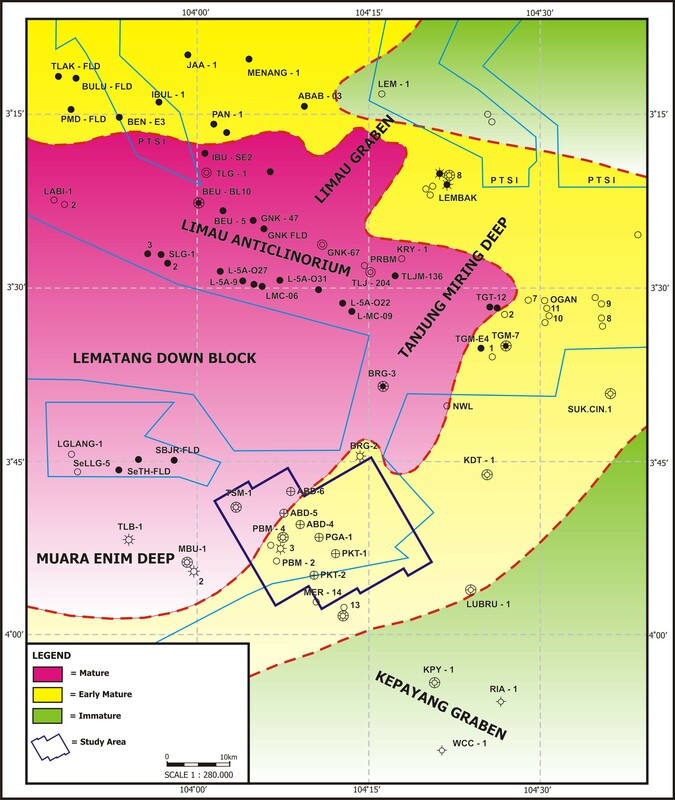 The lopatin analysis from previous study states that the hydrocarbon was generated after deposition of the Air Benakat Fm. sediments had been completed (Sardjito et al, 1991). Clastical carbonate facies of Baturaja Fm. with tight permeability in several places may a good intra formational seals while Gumai shales considered as regional seals. The field development strategy could be concerned in the fault system around of the basement high into cover the hanging wall blocks of the fault. Figure 7. Maturity map of Talang Akar (TAF) and Baturaja Formation (BRF) (after Sardjito et al, 1991). The stream table is a box which consists of 1.8 X 0.8 X0.16 m size with an inclined bottom. The bottom levels off, at the lower end, to form depositional basin. The water filled the basin and its depth determined by adjusting the base-level of the standpipe. Basically, this tool provides an analogue morphology and sedimentology model in various types of fluvial and deltaic processes (e.q depositional, erosional and river formation). The experiment material consists of polymodal, very fine to coarse quartz sand (74 – >300 µm). The sediment supply, water discharge and subsidence in the tools were constantly set-up, except base-level. The stream table experiment has been successful to display several fluvial deltaic morphology (eq. 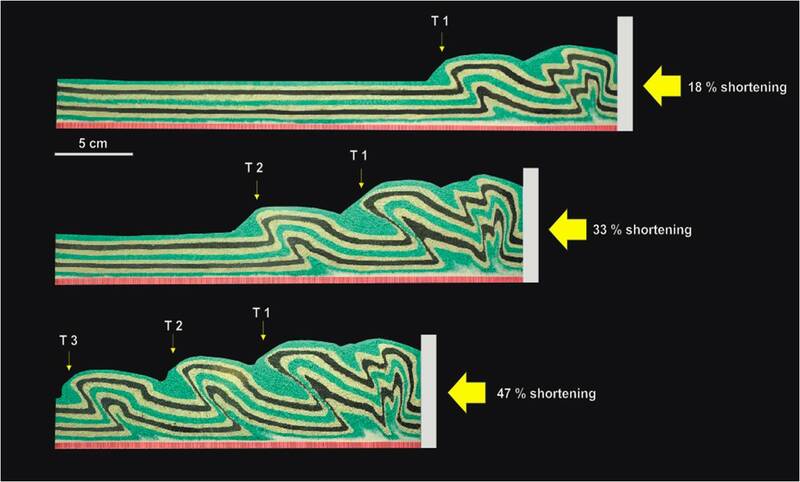 distributary channel, incised valley, fluvial point bar, fluvial meandering channel, highstand & lowstand delta, longitudinal & side bar, braided channel) as shown in (Figure 1) and (Figure 2). The whole process of modeling ran in ± 3 hours. Tentative results of the experiment demonstrate that the distribution of the morphology was dominantly controlled by basin slope and response of base-level changes. Figure 1. 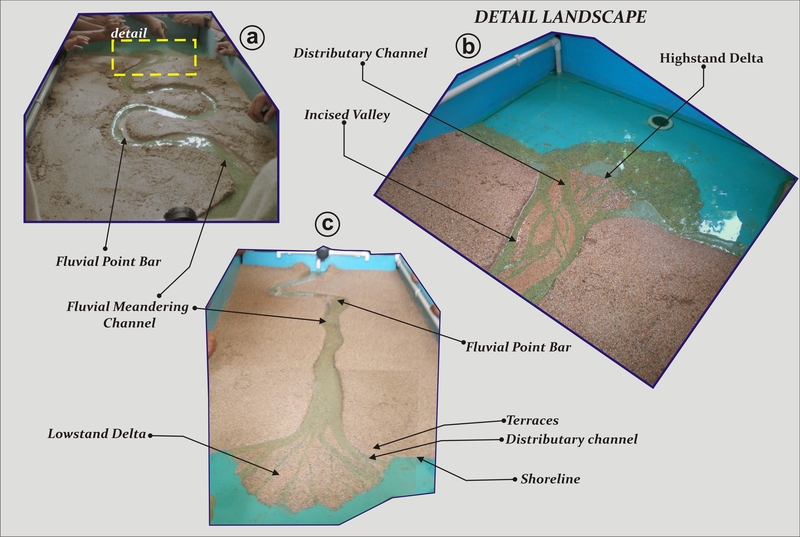 (a) Meandering stream in the experimental landscape (b) detail landscape shows higstand delta morphology and (c) lowstand delta formation during base-level fall. Figure 2. 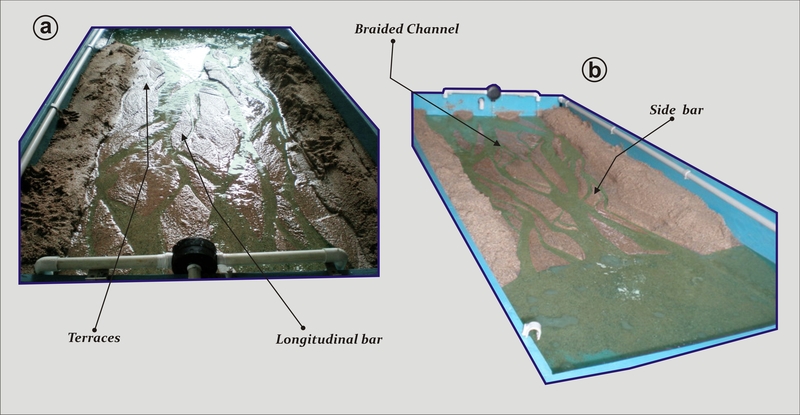 Braided stream simulation yields braided channel, longitudinal and side bars morphology. Experimental landscape both in (a) plane and (b) perspective views.